Our new Siphon Coffee Brewer delivers the theatrical beauty and precision of traditional full immersion vacuum brewing, yet is simplified for the home, making a complex and velvety cup of craft coffee. Through precise temperature and vacuum technology. Securely holds the brew unit in place until brewing is complete. Bright and rich with a clean finish. Securely holds the brew unit in place once brewing is complete. The carafe neck is wider than most manual siphon coffee necks, making cleaning easier. Stainless steel and cloth filters allow for different textured coffee and are easy to rinse clean. no disposable filters required. Premium glass construction with stainless steel accents. For a quick introduction to the use of your Siphon Coffee Brewer, access the guide below. KCM0812 Siphon Coffee Brewer Onyx Black is rated 5.0 out of 5 by 5. Rated 5 out of 5 by Brewster from Great easy to makecoffee and NO PODS! I have used this brewer for a month and the family are very happy enjoying the full bodied flavor coffee it makes. It is easy to use with the bonus of the aroma of freshly brewed coffee wafting through the house.We have experimented with different coffee brands and found that even using the more expensive coffee bean brands it is more economical than pods. This brewer makes a vastly superior tasting coffee than a pod machine and is more environmentally friendly. Cleaning is not an issue with coffee residue added to our compost bin. 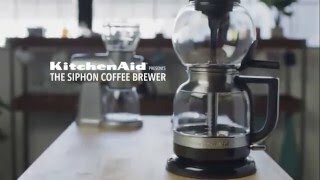 We love our KitchenAid coffee mate! . 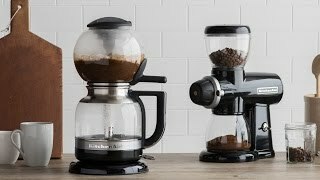 Rated 5 out of 5 by paul v from makes a good strong coffee which i like bought this a week ago and have found it a beautiful machine, great design and totally functional for its purpose, ....too make a good strong coffee !!! Rated 5 out of 5 by Petsi from Very aesthetic, practical and easy to use I bought this product a few days ago and I am very happy with its functionality, design, quality of materials and simplicity in use! Rated 5 out of 5 by Jana Jones from Was exactly what I expected . Same great quality We have only had it a few days but we are very happy with the coffee it is producing .